There was a time when the guitar was not considered to be an appropriate instrument upon which to convey the beauty of classical music. It was thought to be too common an instrument. This was the time of Fernando Sor (1778 – 1839). Many people consider Sor to be the “Mozart of Spain.” Sor is known for his complex and beautiful guitar compositions which challenged the then popular notion that not only was it an inappropriate instrument upon which to play classical music, but that it should only be used to accompany other, equally pedestrian instruments. Given Sor’s abilities with the guitar, it is not surprising that he would lead a revolution of sorts that would pave the way for other guitar virtuosos such as Matteo Carcassi, Julian Bream and of course Andrés Segovia. We at Superior Academy of Music would like to offer a brief biography of this iconic classical guitarist/composer. 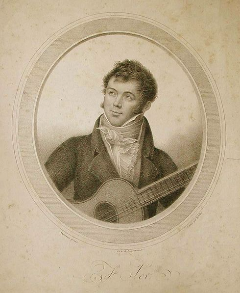 Fernando Sor was born into a fairly well-off Spanish family and was baptized as ‘José Fernando Macarurio Sors.’ Despite the expectation by his parents that he follow a military career, Sor became fixated with music and the guitar in particular. In fact, by the age of 11, Sor had already begun to compose music. Sor continued his music studies at the monastery of Montserrat to the chagrin of his parents who still hoped that he would pursue a military career. During the reign of Napoleon (circa 1808), Sor was swept up by a sense of nationalism that was reflected in his music. He very much loved Spain, which was at the time being invaded by the French ruler. Sor died of a throat ailment in 1839 after ushering in what many people call the “The First Golden Age of the Guitar.” For a brief time after his death, the guitar slipped back into its reputation of being a low instrument unworthy of being used to express the beauty of classical music. Eventually, this idea would change thanks to his body of work. Sor, more than anyone else, helped to dispel the notion that the guitar could not meet the demands of classical music. At our academy, where we have piano lessons in Miami as well as guitar lessons in Miami, we appreciate the contribution Sor has made to classical music and the guitar.